Excuse the cheesy title; I was feeling pretty pleased with my craftiness. As much as I love decor, fashion, and all things beauty, one feather that I have never been able to put in my cap is being crafty. DIY and I are not friends. If DIY and I were in high school together, I would be the sad clueless girl chasing after DIY asking if she wants to hang out after school and she would be the one sneering at me and rolling her eyes disdainfully. We do not get along. This is how DIY feels about me. Considering that both of my siblings have art school degrees, you'd think I'd have a smidge of artistic talent. Alas, I do not. As many times as I've tried to DIY or craft something... anything... almost every time, I fail miserably. I've mostly let it go. I can design a room, style an outfit, braid my hair 374 different ways, but when it comes to anything hands-on arty, I'll leave that to the Etsy contingent. Every now and then, however, the DIY bug starts to creep back in. And Pinterest, although I love it so, has definitely NOT helped in that department. Which brings us to yesterday's challenge. Inspired by YHL & Bower Power's Pinterest Challenge (albeit a few weeks late...oops? ), I went through my DIY ideas board on Pinterest and selected a whole bunch of possible projects to try. And then I went to Michael's. Well, stormed Michael's might be more accurate. You may have seen my haul in yesterday's post. I now have about 12 different DIY projects in the pipeline. 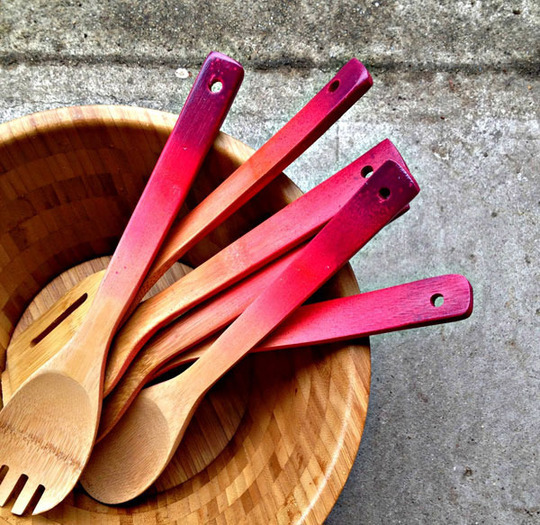 Here is Number One: Painted Wooden Spoons. In true V fashion, I completely forgot to take a before picture. Thus, this cropped beauty from yesterday's post. The pictures below inspired it all. I pinned these wooden spoons ages ago and I haven't been able to stop thinking about them. Aren't they adorable? So when I stumbled on the set of 8 wooden spoons at HomeSense (picture above), I couldn't resist. Now, the ombre set of spoons, as much as I love them (and all things ombre, for that matter), seemed slightly above my skill level. Considering my impressive record of DIY fails, I wanted to start out with something at which I actually stood a chance of succeeding. So I went to Michael's and picked up a bunch of different craft paints and a foam brush, and thus my project began. Given that it was so easy a 5-year-old could do it, I'm super impressed with the outcome. The walls behind are Empire by Valspar, my absolute favourite grey/brown. They still need a coat of food-safe sealant, but as I have NO IDEA where to find one, they'll just have to be pretty and nonfunctional for now until I've had a chance to do some proper research. Apparently Mod Podge is not food-safe, and Michael's doesn't carry anything appropriate for wood that is foodsafe. If anyone has a suggestion, please let me know. Regardless of their (lack of) current functionality, I love the way they turned out! I do wish they had the same variety in shapes and tones as the inspiration photo, but you have to work with what you have.